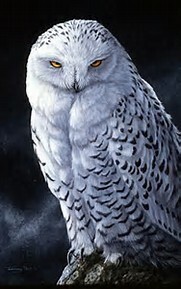 Ruzeke is a large, white owl who is a messenger and personal servant to the goddess Maleah. He has his way of reading another's mind to a certain extent, generally to tell his goddess whether the person is concealing the truth or not. Ruzeke is an immortal thanks to his goddess, and can also speak Latin and Middle English, too. Although he has much talent, Ruzeke is not a very well known bird other than to the other Gods and his mistress herself. And, maybe, those that are lucky to meet him. He even has a personality of being assertive and kind, although he was bound by loyalty to stay by his goddess's side, even if he felt his task was unfair.